Home Children's Ministry Veggie Pirate Spotting! I had another Veggie Marketing sighting when I went to see National Treasure 2. (my first sighting) This was a framed poster in the theater – pretty cool! The movie hits theaters on January 11th! Let me encourage you to take the family and GO SEE IT! It is a great movie, but besides that, we need to show Universal that good wholesome, even Christian, movies are worth investing in! If this movie doesn’t do well in theaters we risk losing the argument that “Hollywood” refuses to produce good movies and help them in their argument that they don’t because people don’t go to see them. Do your part and support the film in the theaters so the market will be encouaged to make more clean wholesome fun entertainment for the kids of America! 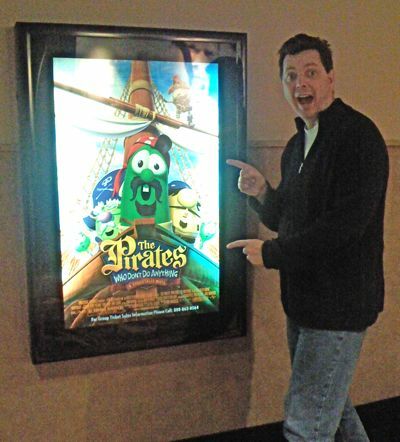 The Pirates film is FANTASTIC and I am praying that God will really use this as an opportunity to show the secular media world that Good entertainment is a worthy investment. I hope that many people will see it in the theaters to boost its success. I know that the “Christian market” is tricky… – thanks for doing what it takes to communicate Truth to a lost but entertainment hungry world. You two are star players in my opinion of meeting the enemy on his own turf and giving Truth a good name where it really matters – shining light in the darkness – and providing laughs at the same time. It’s actually rather profound what you are accomplishing. As I mentioned in my review, this is a very fun film and well worth the cost of admission. For a ton of fun supporting materials about the movie, visit the Kidology Veggie Pirate Page! Chuck Norris on Huck’s Team? I went and saw the pre-screening. I loved the movie and can’t wait for it to come out next week. My family and I are so excited, I can’t wait! Hopefully a lot of other families in my children’s ministry will be going to see it as well.